Well, today, there is a biker who “rode the wind” on the buslane side at the Simprug – Permata Hijau area (Southern Jakarta, Indonesia). Whoaaa.., I thought, cool! 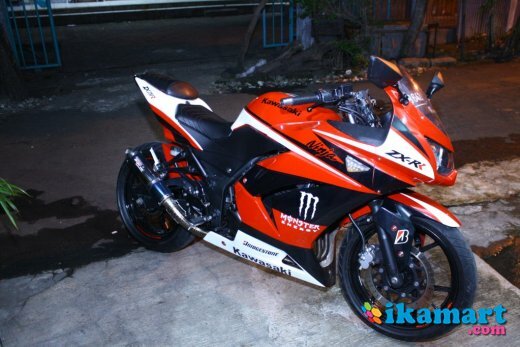 He rides striped red-black-white Kawasaki Ninja 250 CC. The biker is also really stylish, wearing the same color as the bike. Except the helmet. He uses Valentino Rossi’s helmet: the sun and moon. So it’s kinda yellow and blue-ish helmet. But, still, KEWL!!! Okay, you’re alright, I thought to myself. Meanwhile, we–me and the motortaxi–got passed the normal lane: went u-turn at the Permata Hijau tunnel, taking short cut to Senayan Golf area, and voila, arrived at Patal Senayan. But, guess what, not long after we took the right lane in Patal Senayan road, I heard the same sound of the Kawasaki Ninja as the earlier bike. And, yep. There he is–the red-white-black 250cc Kawasaki Ninja, with that stylish biker, Rossi’s moon and sun replica helmet and very cool black hardcase back pack. But, what the heck! Didn’t he get pass us 10 minutes ago? “Yeah he did. Weird biker..” I replied. When we are in front of Mulia Hotel Senayan, about 300 meters from Patal Senayan, well, we met that the red-white-black 250cc Kawasaki Ninja, AGAIN. Yes. The same bike, same biker, same sound. He was trapped on the left lane, wher there are many jockeys (an illegal service people to fool the police on the 3 in 1 area) and stopped cars to rent 1-2 jockeys. And then, 50 meters later, he overtook us. Well, since he rides faster bike, it’s easy for him to do so. But, you know what, again, as we get passed the Senayan Fly Over and took the left lane to The Navy buildings area, THE red-white-black 250cc Kawasaki Ninja also took the same road, and went to Bendungan Hilir area. But he got stuck again with the traffic there, so we get passed him. Hahahaha.. Moral of the story: if you want to flaunt, be smart.